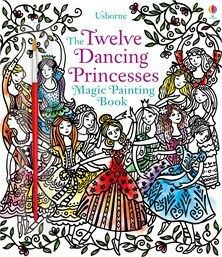 Bring The Twelve Dancing Princesses, the classic Brothers Grimm fairytale, to life with this beautiful magic painting book. Brush water over the black and white patterns to reveal the story and see the pages magically burst into vibrant colour. With a handy flap to stop paint seeping through to the page beneath.